In Canada and other countries, the costs related to health care and loss of work productivity due to mental disorders exceed several billion dollars annually. 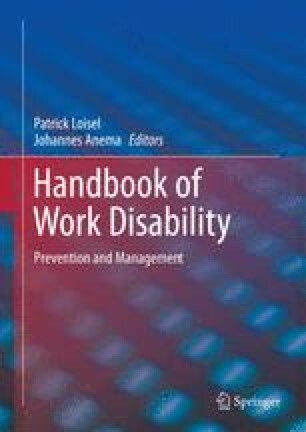 The main purpose of this chapter is to help readers to better understand the relationship between mental health and work conditions. First, the authors present the economic burden of mental disorders in the workplace with particular attention to presenteeism, work absences, and long-term disability. Second, the individual, organizational, and environmental determinants of mental health problems of employees in the workplace are presented. Finally, the individual, organizational, and programmatic factors of return to work for people with common mental disorders are presented, as well as the significant factors of work reintegration of people with severe mental disorders. The presentation of the linked determinants of work participation and work functioning is supported with theories to explain the combination of factors affecting the work outcomes of different populations. Also, services/programmes and interventions designed to facilitate work participation of people with mental health problems or mental disorders are described. Finally, the authors suggest preventive interventions in the workplace as well as future avenues of research. Cox, T., & Rial-Gonzalez, E. (2005). Work-related stress: The European picture. Work-related stress is a strong negative emotional reaction to work. Working on Stress Magazines 5 [Internet]. Retrieved September 7, 2011, from http://osha.europa.eu/publications/magazine/5. EU-OSHA-European Agency for Safety and Health at Work. (2007). Factsheet 74: Expert forecast on emerging psychosocial risks related to occupational safety and health (OSH). Retrieved September 7, 2011, from http://osha.europa.eu/en/publications/factsheets/74.